What ever your trimming requirements, whether standard or a little more unique contact Dave Elliott for quality and innovative solutions. A good fitting, well designed dodger can make all the difference to the look and performance of your yacht. We designs and builds dodgers and canopies that are strong, practical and attractive. 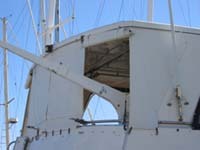 He can recover your existing frame or bend a new one to enhance the lines of your boat. Dodger clear screen covers can also be provided to prolong the life of your dodger. Dodgers and canopies can now be created with Polycarbonate clear windows. Shelter from sun and weather increases enjoyment when out on the water and provides protection and shelter when back in the marina or on anchor – a good fitting bimini provides that shelter and protection. Dave makes standard biminis or can build one using the Hard Top Effect technique. Using Stamoid cloth and a glueing and moulding technique, the Hard Top effect is created with the appearance of a solid looking cover. 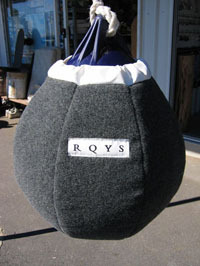 The advantage of this system is that there is nearly no seaming so no weak point or needle holes. The Hard Top Effect is suitable for both yachts and launches due to the flexibility in design – hard tops created have ranged from 3-30 square metres. All boat owners understand the importance of having quality clear screens. Clear screens are a big investment which is why David Custom Trimmers use only quality materials to ensure that years from now your clears will still be looking great and functioning well. With the use of Strataglass we can create clear enclosures with excellent visibility, that have roll up sections for access and ventilation. All zips have molded covers to help each you clear screens water resistant. Our new Polycarbonate clear enclosures offer superior visibility and durability. Flexible zip-out panels can easily be folded out of the way for access and ventilation. Polycarbonate clear screens offer a glass like finish, that can easily be cleaned and maintained. 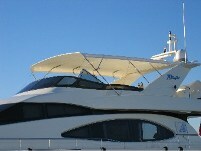 For protection from the sun and weather, we can create a range of solutions to enclose your boat. Covers can be removable or we can add roll up sections for access, zip-out panels or mesh panels for ventilation. 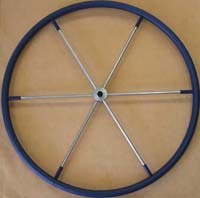 We can also create interchangeable sections to accommodate a range of situations. Canvas enclosures can be combined with clearscreens to protect you screens whilst providing additional shade and shelter. Enclosures can be made from a range of materials including acrylic canvas, stamoid canvas and shade mesh. 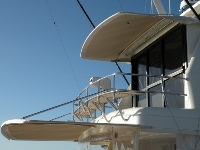 If you require an awning on a frame without the need for support legs, such as a rear deck awning, we can design and build a frame and canopy perfectly suited to the shape and style of your boat. We can also add zips to hang clear or mesh screens to enclose your canopy. Dave has designed a large area sunshade awning that is strong and stable without battens – this has been achieved by utilising the properties of light Stamoid. These also include front V awnings and roll up boom bag awnings. His awnings have survived storms unscathed, when 80knots winds went through the RQYS marina. The awnings provide excellent sunshade, are robust and easy to hoist and stow. Whereas a regular suspended awning needs to be folded and stored when not in use, our boom bag awnings roll out from neat storage bags affixed to either side of your boom. They provide plenty of shade and weather protection,without interfering with your sail or rigging. These awnings easily roll up into slimline bags, which many customers hardly notice attached to the boom. We create Boat Covers of all shapes and sizes, from inflatable tenders to large power boats. 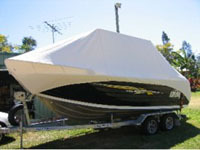 All boat covers are custom made to fit to unsure they do not collect water or become loose in the wind. 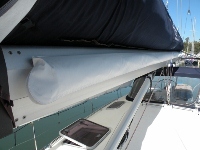 A well fitted Sail Cover is essential to stop wearing to your sails and keep birds from nesting. 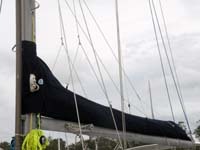 We can make either traditional or lazy jack sail covers that are unique in design. Our lazy jack sail covers are fully lined inside, and we use double sized, heavy duty no.15 YKK zips with moulded zip covers. To protect your boat when mooring, our Jetty Fenders are made from hard wearing foams and materials, with UV stable marine carpet. We are also the first to make Jetty End-Pieces to suit modern jetties at RQYS. Our unique fitting system does not void manufacturers warranties, due to it’s anti-corrosive protection, and provides a neat finish without visible tracks, screws or bolts. Jetty Fenders can be made to any length, and can be full berth length or in sections. … or anything else you require.